So I’m driving to work this morning, listening to the radio, and I hear them announcing some new TV or movie called “Wonderland” taking yet another spin off of Alice in Wonderland, making Alice the bad guy as she’s grown up. A thought struck me, thinking of this and of other spin offs I’ve seen advertised lately, including the new movie “Oz” and the recent Snow White twists. Are these twists? Or could you also label them as fanfiction? If you take this definition at it’s heart, then all the recent stories using Grimm fairy tales, Lewis Carrol’s book, Sir Conan Doyle’s Sherlock Holmes, etc. etc. are all at their heart fanfiction. And they’re selling very very well to the public’s appetite. Of course what we typically consider fanfiction are stories set in other writers’ worlds where the writer still owns the copyrights to the book/movie/etc. Like Harry Potter, for example. Thus fanfiction writers can’t profit from their stories, no matter how good they might be. Their only option is to completely change the world and characters enough that it becomes their own. I understand that “Fifty Shades of Gray” was originally a Twilight fanfiction. I’d bet that there are others. So what do we as writers take away from this? Personally my take is this. Everything that we create as writers comes from somewhere. 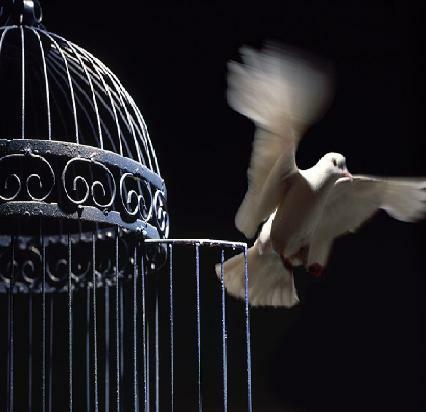 It may come from our life experiences, current world events, things we’ve read, things we’ve seen. Most writers pull from at least some literary source for at least part of their stories. It’s what we do with all these borrowed images and ideas that makes it unique. And let’s face it–sometimes it’s fun to play in a world that’s already been created for us, to play around with the characters left behind. I don’t see anything wrong with this. One just has to be careful in deciding if you’ll be able to claim it enough to be able to sell it to others. There do exist some franchises like Star Trek and Star Wars where you can be hired as a ghost writer to write entire books and profit with them. Dean Westley Smith certainly built a nice career doing this. So call it a twist on an old classic, or call it ‘fanfiction’. Borrowed worlds do have their place. As I look at another disappointing word count for the week–1338 where it should be 2000–I have to remind myself of a few things. One, I have to acknowledge that while things are improving, I’m still in the middle of a family health crisis. Playing caretaker takes a toll. Second, there was a holiday last week, and I tend to be busy on holidays and weekends. (That’s all part of having a family and a child). And last, I didn’t do a lot of writing last month because I was busy with final edits and formatting for my book which was published. Writing exercises a particular part of the brain, and that part has to be trained to sort of “create on demand.” I like to call it the writing muscle, and when you have a period of time when you aren’t writing, it may take a bit to get that flabby muscle back into shape. So when I create a daily writing goal for myself and don’t quite meet it, you can’t look at it as a failure. I’m building back up to speed. 1300 words is a lot better than no words. Just as with exercise for the body, the key is to keep with it. So you missed a day. Make sure you write the next day. Don’t worry about trying to make up for lost time. If if happens, great! You’ve exceeded your day’s goal. But just as you might not want to run fifty laps if you missed the last week, you might find it hard to write seven pages in one day when you’ve been writing only a page. Also remember that you don’t need huge blocks of time for your writing. I could only WISH that I had that luxury! Instead, I usually have to fit my writing into little fifteen minute breaks at work or on lunch, or in little snatches of time at home. I’ve become good at writing in little pieces while keeping the whole intact in my head. In my bed at night is where I do a lot of my plotting–the writing inside my head, visualizing the action. So get on that computer and exercise your writing muscle! Every word is a word closer to finishing your next project. 4718 / 100000 words. 5% done! Hey, just a quick reminder, less than a week left to sign up for a FREE autographed copy of Heart of the Witch! Come check out the giveaway over at Goodreads! This will be ending on January 31, next Thursday, and then I’ll be mailing out the copies. Sign up for it here! 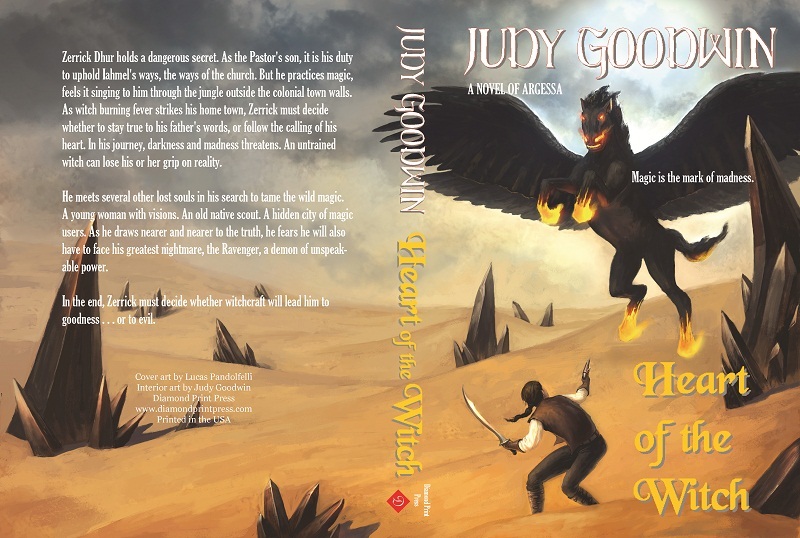 My big news of the day is that Heart of the Witch is finally available in print! The trade paperback can be found currently at Amazon; expect to find it at Barnes and Noble and other retailers some time in the next month. Also, to celebrate this, I’m offering the eBook at a special reduced price of $4.99!! And for my weekly word count tally, last week was still very crazy as I’m playing full time caretaker for a loved one who had surgery on Monday. So the total words for the week: 1491, still not at that 2000 weekly goal I’ve set for myself. With the holiday this week, I probably won’t reach it again, but I hope to do a little better each week. 3418 / 100000 words. 3% done! As I plug along writing on my next projects, I had to stop today to think about the other thing in my life that fulfills me and makes life worth living. My daughter. She’s currently twelve years old, attending 7th grade. For basically all of her life it’s been just her and me; I left her father when she was two years old, because we simply weren’t compatible. Even though I’m in a relationship now, it’s still pretty much me who has the parenting relationship with her. She’s an excellent student, caring person, and very creative in writing, just like me. I guess it’s where we’re so similar that I have the biggest problems in knowing how to guide her. She’s a loner as I was at her age, but at least I had siblings to play with, and neighborhood friends. I think our children these days are overprotected, and it robs them of a lot of things my generation took for granted. Sure there was danger when I rode my bike around the neighborhood–especially since one of my favorite things to do was to explore houses being built in our subdivision, so I was wandering around construction sites with various hazards, including open pits. (My sister almost fell in one and gashed her leg on a nail sticking up–she ended up needing stitches). But it was adventurous, and it made me adventurous, able to take risks and think for myself. I look at my daughter, who is great in school, but terrible if I ask her to solve a problem outside the classroom. She’s been confined to a neat little box, and she doesn’t know how to function outside of that. Anybody else have that problem with their kids? In the end, I’m faced with a dilemma. Do I just let my child be the introvert, keep tot he safety of her books and her computer? Or do I force her out of her shell, make her go outside and meet others in the neighborhood, make her come up with other things to do? My partner wants me to have my daughter limit her time with her grandparents who live close by, because they become like her best friends. Is that the answer? Are we as parents responsible for fixing some of the imbalances we see in our children? Or simply for nurturing them for what they are, strengths and weaknesses alike? It’s a tough question for which I currently don’t have an answer. Just a very quick post today, as I try to keep track of my weekly words written and my 2013 goals. Thanks to needing to take a loved one to surgery on Friday and a whole mess with things on Thursday, I fell short. I’ll likely fall short this week as well, because I had to take them back for another surgery on Monday. It’s been quite a month. I think I’m ready for February already! Total words written last week: 1127 (goal was 2000). 1927 / 100000 words. 2% done! When I looked at my final proof copy, I found some annoying errors. My background is in Creative Writing and also in Illustration, and I’m something of a perfectionist when it comes to those two things, particularly in graphic design. Your cover is your product, at least in that it is the first thing a potential reader is going to see. So for me, it has to be perfect. So I made some corrections, submitted it again, and will have to do yet another proof before I have the printed version available for sale. Boo for missing my deadline! At long last, however, I think I’ve got it. 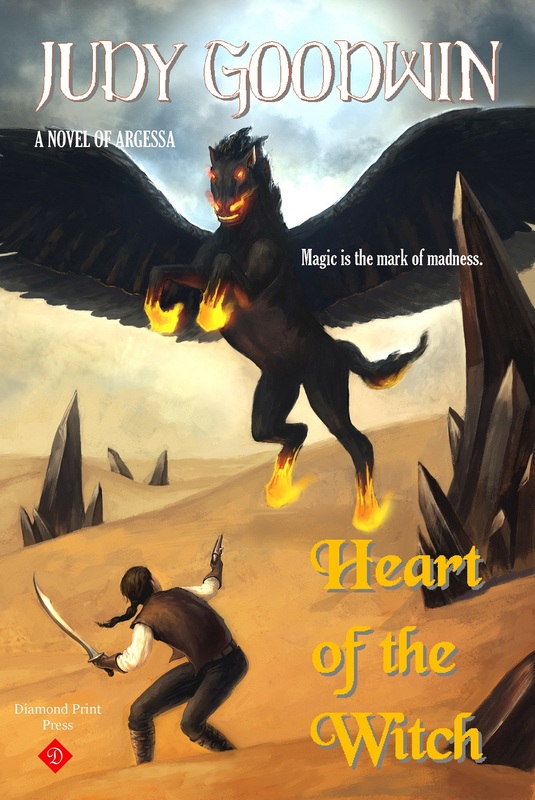 I’ll have to wait a week for the proof, and then another week for it to be available on eStores like Amazon, but here’s the final cover for the print version of Heart of the Witch. And to go along with the release of the trade paperback, I’m offering a Giveaway on Goodreads–three autographed copies will be sent free to the winners! Come sign up!